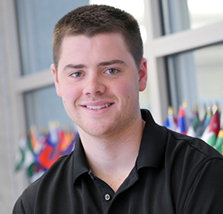 Ryan Hackett, a student in the College of Arts and Sciences and the Maxwell School of Citizenship and Public Affairs, is a double major in political science and international relations. He was recently selected to represent Syracuse University at the 67th annual Student Conference on US Affairs (SCUSA) held at the United States Military Academy at West Point. Held each fall, SCUSA is a four-day conference designed to stimulate thoughtful discussions between civilian students and West Point cadets about the challenges the United States faces in an increasingly interconnected global society. How did you come to be chosen to participate this year’s Student Conference on US Affairs? I was made aware of the opportunity to apply for SCUSA 67 by my advisor, Francine D’Amico, associate professor and undergraduate studies director in the International Relations Program at Maxwell. I had to submit my resume and a small form where I explained how my past experiences make me an ideal candidate to attend SCUSA 67. This past May, I studied abroad in Israel at the Lauder School of Government where the focus of the Maymester was on Middle East policy and terrorism. When I returned from Israel, I spent the remainder of my summer in Washington, D.C., working as a policy assistant for Connecticut Gov. Dannel Malloy’s office. Combined with my academic success at Syracuse so far, the work I did in Israel and all that I was a part of in Washington definitely played a major role in my selection for SCUSA 67. What were the most memorable moments for you at the conference? At the conference, there were about 230 students from 120 plus schools from all over the world. Compared to many of the other 14 roundtables at the conference, my Cyberwarfare group was definitely the most diverse, both culturally and academically. Though a majority were from the United States, my table was lucky enough to have participants from Italy, China, Japan and Colombia. Such a diverse group of individuals made the discussions very intense and informative, yet fun at the same time. Coupled with that, the cadets who ran our roundtable were all on the West Point Cyber Team, so their contributions came in the form of much more specialized technical expertise on cyber issues..
Perhaps the best part of the roundtables was that often times the co-chairs let the students take control of the debate. However, they would often interrupt and give their opinion to challenge our thoughts and opinions. On multiple occasions, I found myself in a very tense yet diplomatic discussion with the co-chairs. These men work daily with military officials, heads of state and other elites all around the world. It was a great feeling to know I had developed the ability to sustain and contribute to such conversations. To top off the great conference, former Secretary of State Madeleine Albright was the keynote speaker on Thursday night. How has participating in the conference changed your outlook regarding your future career? Participating in the conference further reassured my decision to pursue a career associated with domestic and foreign affairs. Being on the cyber roundtable made me realize that though I lack a technical expertise in cyber-related issues, I still possess the ability to apply all that I have learned at Syracuse to present and future matters that our country and world will have to deal with. Currently, I am in the process of applying to Officer Candidate School for the U.S. Navy where, if accepted, I can begin a career where foreign affairs will greatly impact all that I will be a part of and wish to accomplish. No matter what I end up doing, I want to be able to use my knowledge and skills for the greater good and serve and protect those who need it the most. What advice would you impart to future students interested in these topics? I strongly recommend attending SCUSA if the opportunity ever presents itself to a student in the future. Not only will it make anyone a stronger and more knowledgeable student and person, but more importantly, having the opportunity to live with and be immersed within the life of the military cadets truly will cause you to appreciate the sacrifices that people our age decide to make for our country every day.